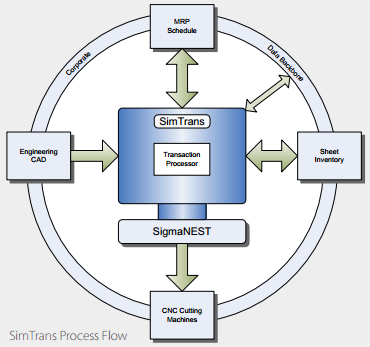 SimTrans is an online transaction manager that serves as a bridge between SigmaNEST nesting software and Material Requirement Planning (MRP) systems, order entry or other management software solutions. Contact us to learn more. Supplies data to business systems at the different phases of the order process, such as work order completion, material consumption levels, etc. MRP and/or other management software usually reside on large, centralized servers or mainframe systems while SigmaNEST is normally installed on workstations. SimTrans acts as the transaction manager between two systems regardless of the platform used for installation. The diagram shows the data flow from the customer through the sales, order processing and engineering systems. SigmaNEST functions at the center of manufacturing operations and maintains its own database of parts, work orders and material inventory. SimTrans permits internal information systems to communicate with SigmaNEST and its database. SimTrans has two shared databases – one for all transactions destined for SigmaNEST, and another with several tables to receive report status information. SigmaNEST populates process feedback information for work orders and inventory, which can be read by other systems through utilizing SQL tables. Enterprise is designed to take care of all data interchange between a central, corporate office and its processing districts. The system interfacing is done from a centralized location. All data is distributed to the districts, and then processing feedback is pushed to the central location for analysis and reporting to the business system. If you’re interested in viewing a software demonstration of SigmaNEST SimTrans, please contact our sales team. Applied Engineering is happy to schedule a web demonstration at a time that is convenient for you. Contact Applied Engineering if you’re interested in purchasing SigmaNEST SimTrans software. An Applied Engineering technology sales consultant can normally deliver a quote to you within hours. Applied Engineering is authorized to sell, implement and train SigmaNEST SimTrans software products throughout the United States through its offices located in Minnesota, North Dakota, South Dakota and Wisconsin.